Cowan London creates new brand design for Supreme Petfoods’ Selective range, showcasing the quality of the range and delivering shelf stand-out in an increasingly busy segment. 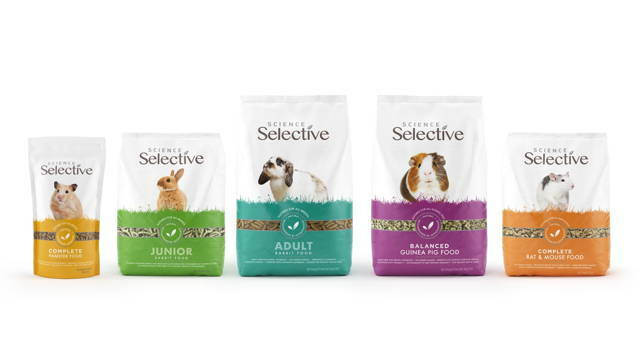 Independent, international design agency Cowan London has created a new design for Supreme Petfoods’ Selective range of food and treats for small animals. The range was developed to meet owners’ increasing demand for products tailored to the needs of each species and age-group of small pets. But as the segment grew and became increasingly fragmented, so did the challenge of achieving brand standout and findability. Research showed that shoppers referred to the brand as ‘Science Selective’, but the brand mark used on pack didn’t reflect this. Cowan London created a clean and contemporary new brand mark that communicates the perfect balance of science and nature that the products are known for, also incorporating ‘science’ into the brand mark for the first time.